You'll be £30.00 closer to your next £10.00 credit when you purchase Lawrie Bond Microcar Man. What's this? Once a common sight on Britain's roads, few people today seem to have heard of the Bond Minicar not a diminutive, gadget laden conveyance for the fictional 007 character, but a popular, practical, motorcycle-engined, three-wheeler that in the post-war austerity period, gave tens of thousands of people affordable personal transport at a time when conventional vehicles were beyond the reach of the average household. Yet whilst the later, mostly imported, 'Bubble cars' have remained in the public eye, it is largely forgotten that the first of the post-war 'Microcars' to go into significant production was the British designed and built Bond. Equally enigmatic seems to be the designer of this vehicle, Lawrence 'Lawrie' Bond a prolific automotive design genius, with a penchant for weight-saving construction techniques. He was responsible for a wide range of two, three and four wheel vehicles; from ultra-lightweight motorcycles and scooters, such as the Minibyke, Lilliput and Gazelle, as well as his other Microcars the stylish Berkeley and perhaps less-than-pretty Opperman Unicar and finally to his later work, including the innovative, but troubled Bond 875 and styling the Equipe GT sportscar. 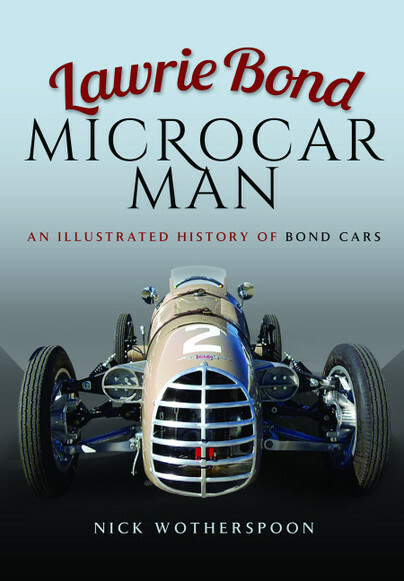 Here the story is told in full, covering all Lawrie's innovative designs and the various vehicles that bore his name, all in prolifically illustrated detail, together with his passion for motor racing, which resulted in a number of technically acclaimed racing cars, some of which can still be seen competing is historic racing events today. This is an absorbing read which anyone with an interest in British Automotive history will discover to be essential material. The book is quite well organized and has an exemplary Table of Contents that, coupled with a good Index, makes looking for specific items easy. Illustrations are plentiful, some in color, and include technical drawings and ephemera. Appended is information about owner clubs, museums, and chassis numbers. It is also very well written and on that count alone will make converts who may have never thought of devoting any attention to a maker that too often is merely a footnote but deserves so much better. This is just the book that could persuade those who applaud minimal motoring to seek ownership of a Bond minicar. This bright and colourful book is a motor enthusiast's delight. This is the fascinating story of Lawrence Bond, the brilliant racer-turned-designer who kick-started Britain's post-war small-car industry. As Nick Wotherspoon points out, we're all familiar with bubbles but the Minicar beat them to market by five years. Bond could turn his hand to anything, from scooters to sports cars such as the Berkeley. Their development is described in fine detail, illustrated via a wonderful mixture of archive material and recent colour photos. The story is brought up to date via the painstaking restoration of the front-drive Formula Juniors and their return to competition in historics. It's superbly printed, on lovely paper, and an absolute bargain. A truly inspirational story of a pioneer in the automotive industry = Bond was responsible for a number of amazing car designs - I've never been that fond of three-wheeled vehicles personally, but this history of Lawrie Bond's amazing designs is inspirational and fascinating, almost larger than life! The work comes magnificently illustrated, 17 color photographs and no less than 135 in black and white, most never before seen. A curious and very interesting book. Nick Wotherspoon BA (Hons) has been actively involved with vintage and classic vehicles for most of his life, owning several Bond vehicles over the years, including two currently, one of which is under restoration. He has maintained an strong interest in the Bond story, since researching the subject for a final year dissertation at university. This evolved into an earlier, now long out of print, work on Bond cars (1993) and a television documentary (Inside Out, BBC 2009), as well as more recently being commissioned to write the entry on Lawrie Bond for the Oxford Dictionary of National Biography. A former librarian, he currently works for Lancashire County Council Cultural Services and lives in the Ribble Valley.